Have you ever tried to calculate the value of Pi, the ratio of a circle's circumference to its diameter? Are you wondering how Archimedes first calculated Pi over 2500 years ago? The concept of the Pi calculation is anchored and the secret is hidden in the eye-opening premise that six circles fit exactly around a same-size inner circle. When we connect the center of each circle to the center of its neighboring circle, we create six equilateral triangles. Together, the six triangles form a hexagon, a quasi-circle of six sides. The circumference of this six-sided hexagon is 3 times its diameter. For this unfinished, jagged but uniform circle, the '3' could be said to represent the elementary Pi ratio. As we refine the circle, doubling the number of sides, over and over, we can calculate ever more precise Pi values. The circle will never be totally round, and the Pi number can thus be calculated to infinity. For our project, we start with the drawn six-sided hexagon. Since all three sides of the six triangles are equal in length, the sides of the triangle also represent the radius of our rough circle. If we add up the outer sides of all six triangles we get a value of six times the radius, or three times the diameter, a rough approximation of the 3.14 number for Pi that we try to calculate. That is our starting position. To get to a refined, more accurate value of Pi, we need to smoothen the circle. For these calculations, we rely on the ingenious Pythagorean theorem which states that the square of the hypotenuse (the side opposite the right angle) is equal to the sum of the squares of the other two sides. Step by step we will double the number of sides of the circle. With more sides, the circle becomes rounder and smoother, and the Pi value nudges closer to its infinite value. Although the circle will appear round to the eye, mathematically, the circle will never be perfect, and the Pi can be calculated to its infinity. Now that we know the value of RA, we calculate the value of RB, by simply deducting the RA from the value of the radius. With this calculation, we now have 12 equal sections around our circle and the Pi stands much improved at 3.13. Better, but that is not good enough. So we continue. Using the same steps as above, we cut the sections by half again, and again. The Pi improves to 3.139, then 3.141. Once we get to 20 iterations, we have a near-perfect Pi value of 3.14159265358976. Of course, we write a simple program to do this for us. The sample code is shown below. We can calculate to infinity; a number is never too small to be cut in half. A full circle is expressed as 360 degrees. The common belief is that the number 360 is based on the number of days of the full solar cycle, thus each day representing one degree. The Sumerians and Babylonians of Mesopotamia used the Sexagesimal numbering system (Base-60). Since our quasi-circle has six sides, one could also speculate that Sumerians may have originated the 360 degrees based on the six-sided circle. Here is a simple presentation to prove the Pythagoras Theory which states that the square of the hypotenuse (the side opposite the right angle) is equal to the sum of the squares of the other two sides. The origin of the weekday names is fascinating. The history behind the established sequence of the day names is simply mind-boggling. We know that the names of all the seven days are related to celestial bodies, the moon, planets, and stars. Most day names in the Roman languages clearly reveal the linked star. In the Germanic languages, the days relate more to the Gods or Goddesses that are associated with the star. We will now explore the perplexing sequence of the weekday names. In the ancient world, only seven of these heavenly objects were known by name and revered. The planets Uranus and Neptune had yet to be discovered. Each of the seven stars was sacred and each was the embodiment of a God or Goddess. Each new day was devoted to a Star God, in a seven-day rotation. But why are the names of the weekdays not in that same traditional order? They seem set in a random order. Why is the day of Mars before the day of Mercury? Why is Tuesday before Wednesday? The reason behind the odd sequence of the weekdays is altogether astonishing and eye-opening. First, we must dig into some background. As early as four thousand years ago, the ancient Egyptians split the day into 24-hours, a 10+2 hour day, and a 12 hour night. Time devices, such as shadow clocks, marked 5 hours as the sun ascended and another 5 hours as the sun descended. A twilight hour was added in the morning and again in the evening, making a total of 12 hours of daytime. Given the seasonal variation of sunlight time, the summer hours were longer than the winter hours. The 12 nighttime hours and their length were calculated in relation to the 36 decans. Decans, or zodiacs, are groups of fixed stars, small constellations, that reappear every 24 hours, every rotation of the earth. In ancient Egypt, each hour of the day and night was dedicated to one of the seven known heavenly stars, each the embodiment of a God and Goddess, feared or benign. The hourly dedication proceeded in the strict order of the stars' orbital lineup. There were only 7 God Stars but 24 hours, so every seven hours the cycle repeated itself. The first hour after midnight was primary and dominant. Number 7 does not evenly divide into 24, and the pick of the day's first hour thus shifted out of order. The God or Goddess of the first hour after midnight owned the new day, and the new day was named after Him or Her. This animated Gif image demonstrates the drill and workings. Why was the number 12 so important? Perhaps it is the number of the twelve moon cycles in a year, perhaps because it is a convenient number, divisible in so many ways. A theory has been brought forward that the number 12 is linked to the ancient practice of finger-bone counting in Mesopotamia. With one hand, the people used their thumb to touch and count the finger-bones; four fingers, each with three bones, a count of 12. With the five fingers of the other hand, they tracked and counted the counts-of-12, for a grand total up to 60. There were other reasons why the number 12 was so central and useful. The 12 moon cycles in a year come to mind. That is probably irrelevant, but the high divisibility of the number 12 makes it so special. The finger-bone counting method is likely the foundation of the Sexagesimal (base 60) numbering system used by the Sumerians and Babylonians, a system that amazingly we still use today when referring to degrees, minutes and seconds. However, the finger bone dabbing theory may fall apart when we look into the makeup of Babylonian cuneiform numbers. Cuneiform numbers, although based on the Sexagesimal system, clearly use wedge symbols for units of 10, but none for units of 12. Could it be that finger bone counting predates the cradle of cuneiform writing. In Roman-influenced languages, most weekdays still carry the name of a star; in the Germanic languages, many of the days took on names of Germanic pagan, like Tiw, Wotan, Thor, Frigg. There are some logical connections. Both the pagan Gods Tiw and the Mars are Gods of War. There are known associations between Gods Wodan and Mercury going back to Roman times. Thor and Jupiter are both Gods associated with Weather, and Friig is the Goddess of love and lust, in the image of Venus. Tuesday: Named after the Germanic god Tiw, the god of single combat, god of war and law. God Tiw is associated with the Latin god Martii, equated with Mars. The French name for Tuesday is 'Mardi' for mars. Wednesday: Named after the all-important Germanic god Wodan. The Romans identified Wodan with their god Mercury. The French name for Wednesday is 'Mercredi', for Mercury. Thursday: Named after the god of Thunder, god Thor, associated with the Roman god Jupiter, god of skies and thunder. "Iovis dies", Jupiter's day, became the French day name 'Jeudi'. Friday: Named after the goddess Frigg, associated with the Roman goddess Venus, goddess of love, lust, and fertility. The French name for Friday is 'Vendredi" for Venus. Sunday: Named after the Sun. The golden ratio is one of the most amazing phenomena in nature. It is the space where the universal law of nature is in harmony with the rule of mathematics. No wonder, it is also called the divine proportion and the golden number. 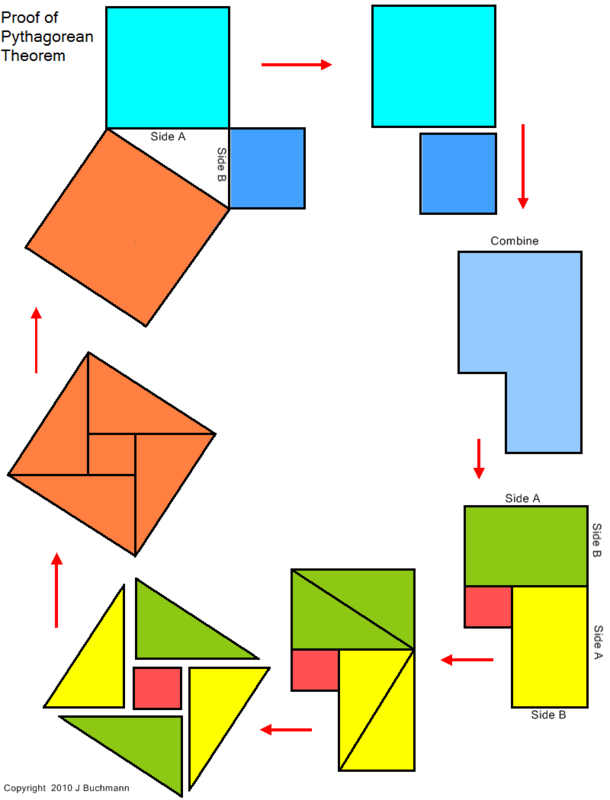 In mathematics and the arts, the shape of a rectangle has a golden ratio if the ratio of the longer side to its shorter side is the same as the ratio of the total of both sides is to the longer side. An object created by man or nature, built in an exact golden ratio, is of perfect beauty to the human eye. By a general rule of nature, two related parts are either symmetrical or they are sized to relate each other in the golden ratio. I will refer to that amazing ratio simply as Ratio. A rectangle or ellipse is at its most aesthetic look and completeness if the width to height is in the Ratio. Early artists and architects were well aware of the importance of the Ratio. The architectural design of the Parthenon in Athens has many elements that follow the rules of Ratio, by instinct or by calculation. Most books printed in the 16th to the 18th century had heights and widths exactly in harmony with the Ratio, accurate to within a tenth of an inch. The Mona Lisa painting has Ratio dimensions. The divine proportion of the rectangles gives the artwork the most appealing and pleasing appearance. Nature also uses the Ratio. Almost everything in nature has some golden ratio aspects. 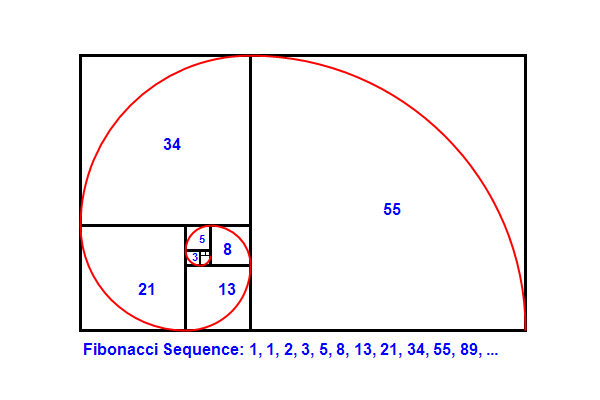 The numeric steps that lead to the golden ratio are known as the Fibonacci Sequence. The Fibonacci Sequence can be demonstrated by building a plane formation of squares. Start with one square, then add additional squares next to it of a size equal to the widest side of the existing assembly. As more and more squares are added, the squares get larger and larger and the ratio between the short and the wide side of the resulting build gets closer and closer to the Golden Ratio of 1.61803399..., but never exceeds it. A ratio is an irrational number, it is never exhausted. The sizes of the squares that you add represent the Fibonacci Sequence. The number in the Fibonacci Sequence is always the total of the previous two numbers, thus the sequence is 1, 1, 2, 3, 5, 8, 13, 21, 34, 55, 89 etc. The size ratio of the last added square to its immediate predecessor represents the Golden Ratio, for example, 89 divided by 55. It is one of the most amazing revelations when you see the Fibonacci numbers everywhere in nature. These numbers are Nature's way of counting. Consider the numbering of the growing and living things in nature: Children have 5 teeth on each side, 8 teeth for adults, 5 fingers, 5 toes, petals in flowers, seeds on flower heads, and spirals in sunflowers. More often than not they match Fibonacci numbers. Shrimps have five pairs of walking legs and five pairs of swimmerets. The miracle of music has its foundation on the octave of eight tones and five semi-tones. On the piano keyboard, you see the semi-tones in an arrangement of two and three. The numbers 8,5, 3, 2 are all Fibonacci numbers. Look at your hand and its joints. The three phalanges of the finger have the familiar ratio of Fibonacci, the same extending to the metacarpus of the hand. Some flowers have four or six petals. Oh, these are not Fibonacci numbers. But look at the flowers, and you will see that the petals are in two layers, thus each layer being a Fibonacci number. The value of the golden ratio is 1.618033... and is calculated by taking the square root of 5, adding 1 and dividing the result by 2. Or refer to the Fibonacci Sequence, divide a value by the next lower value in the sequence. The names given to the months have nothing in common with mathematics but one can argue that they have some relationship to numbers. It is an interesting subject; we give scarce thought to some weird abnormalities rooted in our calendar. Do you know why in the world the residual leap-year days are adjusted in February instead of December? With the 30-day and 31-day months orderly alternating, why is there an exception for July and August? Why is September the ninth month when the number Seven is in its name, like 'septem' in Latin? Just like the mystery of the sequence of week names that I explained in the section above, there are good explanations for all of these questions. We all know, a month represents a moon cycle. The moon cycles do not calibrate neatly into a 'sun' year. Twelve moon cycles represent about 254 days and a solar cycle is just over 365 days. Over the long span of history, different approaches were used to handle the discrepancy. In the early years of the Romans, the year started with March and consisted of only ten months. The two moons after the ten-months period were a nameless dead season in the midst of winter when nothing was growing. March, the first month of the year was named after Mars, the God of Wars, aptly named for the month when, after the quiet winter season, the soggy soil firmed up, daylight grew longer and young men were called back to war to conquer new lands and bring home the booty. April has its origin in Aprilis, 'the month that opens', perhaps alluding to the buds opening up in spring. It has been argued also that April may be named in honor of Aphrodite, the Goddess of Love and Beauty. With the young men far away fighting, leaving the wives home alone, one can assume that this is a remote possibility. Unlikely. May and June were probably named after the Roman Goddesses Maiesta and Juno. The remaining six months were simply named after their respective numeric position. Keep in mind that March was the first month. So, Quintilis (July) was the name of the fifth month, Sextilis (August) of the sixth month, then Septilis, Octilis. Novem and Decem are the root words for the ninth and tenth months. Around 700 BC the Romans decided to add the two 'dead' winter moon cycles at the beginning of the calendar year. Januarius was named after Janus the God of Gates, Lord of beginning and ending, his head appropriately depicted with two faces looking in opposite directions, looking back at the old year and looking forward to the new year. Februarius refers to Februa the festivals of purification celebrated in Rome that month. A root word for Februa refers to 'burning' relating perhaps to fever. It makes good sense; we all get a cold or the flu when our defenses are down after a long winter. Adding the two months in front explains why the names of September to December are now out of whack with their embedded sequence number. For example, 'Dec' meaning 10 is now the 12th month. The number of days in a given month varied. Originally, the months had either 30 or 31 days. The Romans viewed odd numbers as more propitious than even numbers. An odd number felt more copious because there was some extra after an equal split. Thus the 30-day months were changed to lucky 29-day months. The left-over days were handled differently over time but essentially taken care of in the month of February or with an extra month inserted after February. February, it appears, still has the standing as the 'end month' from the time before it was moved up front. Still today, it is the handler of the residual days. Then arrive the Roman Caesars and Emperors with their big egos. Julius Caesar wanted a month named after him. Quintilis the fifth month be named July, he ordered. Not to be outdone, Emperor Augustus claimed the sixth month Sextilis for him. Julius' month had 31 days but Augustus' Sextilis only 30 or 29. It was not acceptable for Augustus to have his month with a number of days lower and less favorable than that of his uncle Julius, so the number of days in August was increased to 31, and it still is today. In North America, we print our cherished work on letter size paper without giving any thought about the irrationality of that paper size. We don't know how that format came into common use; it just happened over time, and we got stuck with it. The format has no logic to it. No thought process contributed to its formulation. The origin of the format is buried in middle-age history. Decades ago, the Europeans developed and propagated paper sizes that are based on the 'Square Root of Two' ratio, now also dubbed the Lichtenberg ratio. It follows the clever Metric system. The ingenuity of the v2 ratio is that when the paper is cut or folded in half lengthwise, the two halves also are of the exact same aspect ratio as their parent. The scheme has three series, the 'A' series being the most important one. Thus, the paper size A0 has a total area of 1 square Meter. The ratio of width to height is 1 to1.4142, the value of 1.4142 being the square root of 2. When you cut the A0 paper sheet in half, you have two A1 size sheets, and when turned 90 degrees, both pieces have exactly the same width-height ratio as the original A0. The A1 cut in half again creates two A2 sheets; cut again it creates two A3s, then A4s, and so on. The A4 is the most commonly used paper size, the equivalent of the North American Letter Size. The thought behind the ratio is so ingenious, it challenges the human mind. In addition to the 'A' series, there is a 'B' series. The 'B' paper size uses the same principle. It starts with a width of 1 meter and the length of the Lichtenberg ratio (v2 = 1.4142). The B1, B2, B3, etc are the sizes that descend from the larger size cut crosswise in two. Furthermore, there is a 'C' series of paper size. The 'C' sizes are the arithmetic average of the 'A' and the 'B' sizes. They are thus just slightly larger than the 'A' size and are perfectly suited for envelopes of A-type sheets. In America, the Letter Size has been in common use for decades. In 1980-01, the Reagan administration with a somewhat shortsighted mindset decided and declared the 8.5x11 inch format as the official paper format for all U.S. government offices. No special effort was made to analyze if that format provided an optimum size for commercial letterheads. It appears that this standard was just a commercial compromise to safeguard the existing paper inventory and to avoid significant changes to existing production and printing equipment. Some people feel that it was an attitude of 'not-invented-here'; why adopt a standard developed in Europe, when we already have our standard. Canada and Mexico's opinions were thwarted and they are stuck with the antiquated format. In 1996, realizing the ingenuity of the European standard, the prestigious American National Standards Institute, agreed on a mimicked standard based on the 8.5x11 letterhead. The double-size of the now common 8.5x11 inch letterhead became the 'Ledger' size', and if rotated, the same paper got the name 'Tabloid'; all other sizes in the series remained nameless. Not surprisingly, there were not many followers. It is the time that North America catches up with the rest of the world; it will be to their economic advantage long-term. And why not adopt the universal Metric system at the same time. USA, Liberia and Burma are the only countries that have not yet adopted the Metric system.